Over 250 military children and their families from all three armed services came together for a special Military reconnection camp in Pirbright this weekend. The camp, which began Friday evening, was organised by the charity Little Troopers. 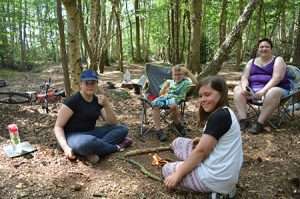 Over the weekend the families got to take part in activities including woodland cookery, survival techniques, climbing wall and a party night. The annual camp is an action-packed weekend, which encourages families to reconnect with one another after periods of separation, as well as meeting others who understand the unique challenges of military life. The Summer camp was made possible through the charity’s fundraising. Particular thanks go to the Officers Association who provided the funding for the Party night and Sharla Jones who has organised a number of events and raffle prizes in order to raise funds for the camp.